Since 2010, the best estimate of the age of Earth’s magnetic field has been 3.45 billion years. But now a researcher responsible for that finding has new data showing the magnetic field is far older. John Tarduno, a geophysicist at the University of Rochester and a leading expert on Earth’s magnetic field, and his team of researchers say they believe the Earth’s magnetic field is at least four billion years old. The findings by Tarduno and his team have been published in the latest issue of the journal Science. Earth’s magnetic field protects the atmosphere from solar winds—streams of charged particles shooting from the Sun. The magnetic field helps prevent the solar winds from stripping away the atmosphere and water, which make life on the planet possible. 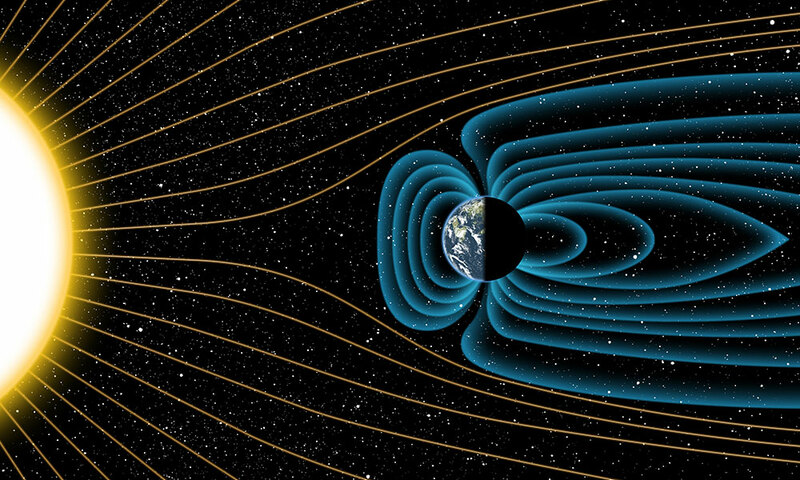 Earth’s magnetic field is generated in its liquid iron core, and this “geodynamo” requires a regular release of heat from the planet to operate. Today, that heat release is aided by plate tectonics, which efficiently transfers heat from the deep interior of the planet to the surface. But, according to Tarduno, the time of origin of plate tectonics is hotly debated, with some scientists arguing that Earth lacked a magnetic field during its youth. Given the importance of the magnetic field, scientists have been trying to determine when it first arose, which could, in turn, provide clues as to when plate tectonics got started and how the planet was able to remain habitable. Fortunately for scientists, there are minerals—such as magnetite—that lock in the magnetic field record at the time the minerals cooled from their molten state. The oldest available minerals can tell scientists the direction and the intensity of the field at the earliest periods of Earth’s history. In order to get reliable measurements, it’s crucial that the minerals obtained by scientists are pristine and never reached a sufficient heat level that would have allowed the old magnetic information within the minerals to reset to the magnetic field of the later time. The directional information is stored in microscopic grains inside magnetite- a naturally occurring magnetic iron oxide. Within the smallest magnetite grains are regions that have their own individual magnetizations and work like a tape recorder. Just as in magnetic tape, information is recorded at a specific time and remains stored unless it is replaced under specific conditions. Tarduno’s new results are based on the record of magnetic field strength fixed within magnetite found within zircon crystals collected from the Jack Hills of Western Australia. The zircons were formed over more than a billion years and have come to rest in an ancient sedimentary deposit. By sampling zircons of different age, the history of the magnetic field can be determined. The ancient zircons are tiny—about two-tenths of a millimeter—and measuring their magnetization is a technological challenge. Tarduno and his team used a unique superconducting quantum interference device, or SQUID magnetometer, at the University of Rochester that provides a sensitivity ten times greater than comparable instruments. But in order for today’s magnetic intensity readings of the magnetite to reveal the actual conditions of that era, the researchers needed to make sure the magnetite within the zircon remained pristine from the time of formation. Of particular concern was a period some 2.6 billion years ago during which temperatures in the rocks of the Jack Hills reached 475°C. Under those conditions, it was possible that the magnetic information recorded in the zircons would have been erased and replaced by a new, younger recording of Earth’s magnetic field. Instead, Tarduno found that the minerals revealed varying magnetic directions, convincing him that the intensity measurements recorded in the samples were indeed as old as four billion years. The intensity measurements reveal a great deal about the presence of a geodynamo at the Earth’s core. Tarduno explains that solar winds could interact with the Earth’s atmosphere to create a small magnetic field, even in the absence of a core dynamo. Under those circumstances, he calculates that the maximum strength of a magnetic field would be 0.6 μT (micro-Teslas). The values measured by Tarduno and his team were much greater than 0.6 μT, indicating the presence of a geodynamo at the core of the planet, as well as suggesting the existence of the plate tectonics needed to release the built-up heat. The magnetic field was of special importance in that eon because solar winds were about 100 times stronger than today. In the absence of a magnetic field, Tarduno says the protons that make up the solar winds would have ionized and stripped light elements from the atmosphere, which, among other things, resulted in the loss of water. Scientists believe that Mars had an active geodynamo when that planet was formed, but that it died off after four billion years. As a result, Tarduno says, the Red Planet had no magnetic field to protect the atmosphere, which may explain why its atmosphere is so thin. “It may also be a major reason why Mars was unable to sustain life,” said Tarduno.